Found 2 results for tag "ball"
DOT!!!!!!!!! DOT DOT DOT DOT DOT!!!! 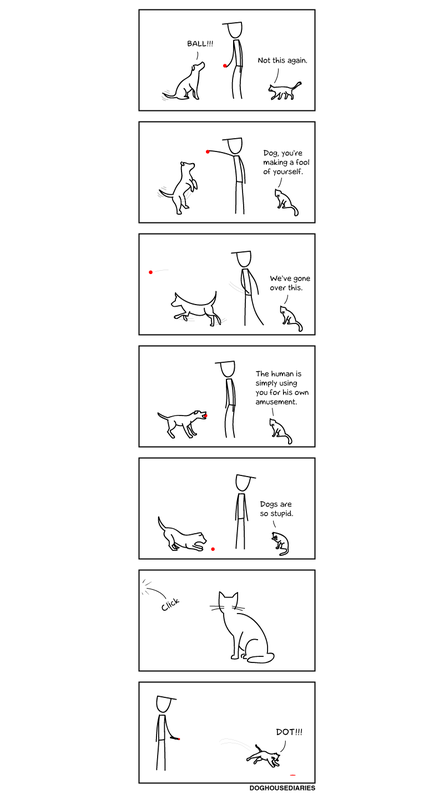 Here's to all of you cat fans and wonder why pets act the way they do. With this week looking up so far, I am looking up for what the rest of the week has to offer. My to-do list has been slowly shortening, which is always a benefit. I sent a potential client a quote, which is looking very positive from our new sales person. Also, our Site Analysis process is working well since it helps reduce the amount of work needed to complete a Site Analysis. I had a major overhaul of server security this morning, with many of the 404's and IP's from the weekend. That took a while, but I think it should work a lot better against server attacks. We were planning on launching a client's site today, and it may go as planned if everything goes well. It's a little different then what we originally planned, but C'est la vie. We were also contacted by Fox News for a spotlight location on their home page. A very inciting offer, but I contacted Dr. Hughes to see what his opinion was. We should have a decision by tomorrow whether to accept it (which is a benefit to us, and great market exposure), or deny (which although would be a bad decision, would save our money). I am also working on a mobile version of the PiLam site which should be easier to load on mobile devices. I thought it would be better since it is getting a lot more traffic, and the new year just started (and loading the "Brothers" list on a mobile device takes a while). I did accidentally cause a minor server outage (less than 5 minutes) while adding the mobile subdomain, but it was fixed. Apparently, Apache decided that it wanted port 80 and wasn't giving it up no matter what. I had to almost go all TRON on the server and kill the process myself, but I didn't have to since I could kill -9 it. Keat starts school today, so she is officially a Catamount (again). She had Japanese class today, and when she talked to Sensei, he said that I owe him some money. Apparently, I owe him $1 trillion. Where he got that number, I have no idea.